This must be the easiest, quickest, craft-free repurpose that I ever did. Look at my pretty soda cans used as gorgeous flower vases. It doesn’t get easier than this, and I am loving how beautiful it turned out. There was a time when I had a slight addiction to green tea soda. I am not a hundred percent sure if it was the lovely taste of the cold drink or that I was smitten by the design of the containers. Fact is I gave up that addiction but I kept the bottles and cans because they were just too pretty to throw out. I actually moved them over from the old house, but they were buried somewhere in a drawer unit in a box that didn’t have a home yet. I had kinda forgotten about them. But then something triggered me and made me go hunt them down….. I have flowers from my garden!!!!! I have cut four peonies from my own backyard!!! Now this is amazing people, considering the state of my garden. I don’t even want to call it a garden actually, it is more a disaster zone. Knee high nettles everywhere, fencing succumbing under the weight of totally grown out ivy, bushes that are beyond trimming, weeds and more weeds and nowhere decent to sit and enjoy the sunshine. But things are about to change. My garden man is coming soon and he will rip it all out. ALL OF IT. It all needs to go before we can even start thinking about making it look good again. So I am cutting those few lost flowers I can find and enjoying them while I can. And hidden between the nettles and the out of control ground elder I discovered a peonies bush and it had flowers. I am going to try my hardest to save this bush but it will have to be transplanted to a temporary home before I can plant it back to its new permanent home, and peonies don’t like to be moved. But I will try. In the mean time, these beautiful pink peonies made me go look for an original vase idea, I wasn’t going to waste them on just any old white vase. And that’s when this repurposed soda can idea floated to the surface. It must have been the combination of pink and green that made me remember those green tea soda cans and made me go hunt for them. 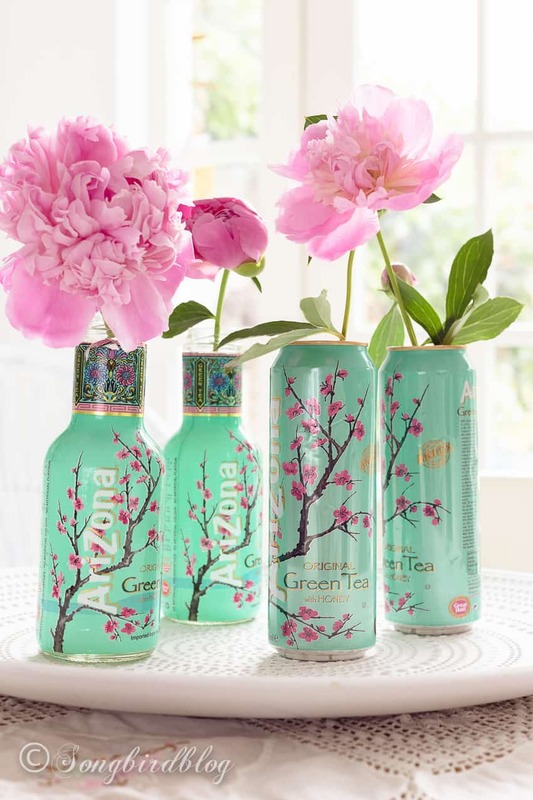 Step 1: Buy green tea soda in pretty bottles and cans. Step 2: Enjoy the green tea, preferably on ice. Save the containers. Step 4: Put flowers in containers that are now magically transformed into beautiful vases. I ooohed. I ahhhed. I then ogled. Beautiful! And then I giggled!! All by myself!!!! I’d have never ever thought to do this yet how gorgeous is this?!! It’s true that there is beauty in the everyday things. Your “former” every day that is! I’m going to check out tea bottles now!